Home › Archive by category "Tips"
The door zone is a real killer for cyclists but is one which is often overlooked and many cyclists are unaware of the dangers. A door opening in your path can cause you many issues, all of them can lead to death. The door opening and you going straight into it, that is quite painful and you could easily hit your head on the door frame or glass. The door opens and you cycle into the edge of it, the edge of a door is very sharp and will cause a lot of damage. The door opens and you swerve around it but into the path of a passing vehicle. You may think that you will be able to stop in time or that you can see into vehicles but that isn’t always the case, a car door can open right in front of you and you have no time to react, a small child may swing open a rear door and you may not be able to see them. 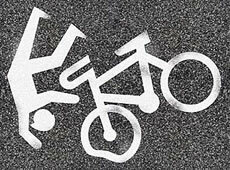 The dangers are very real and each scenario above has taken the life of a cyclist. The way to avoid getting hurt from an opening door is to stay clear of the area that a door opens, it can be a large space and in narrow streets it may actually mean riding on the other side of the road. 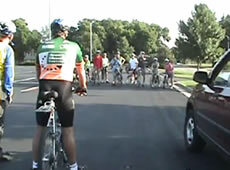 Note that it may be advisable to cycle in the door zone for short periods of time to let impatient motorists past. 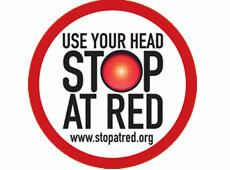 Do you pledge to stop at red lights? Stopatred is a campaign to improve the status of cycling in the eyes of the public and policy-makers alike, and to tackle the attitudes of those cyclists whose behaviour perpetuates the image of cyclists as a low-status social ‘out-group’ on wheels. Jonny Jeez from Cycle Chat has written a guide for commuters, along with the help of other members who have contributed and given him feedback. If you are new to cycling, or have any concerns about riding through a city, then this guide is perfect for you. The attached PDF (see below) is a compilation of ideas and thoughts from the members of the Cycle Chat community, to help keep you prepared and safe. It will be regularly updated to accommodate changes in topic and riding practice. Just download the attached PDF (bottom left) and you are good to go. It’s best to download a copy of the guide from the thread on Cycle Chat, as this is where it is kept up to date.